Porcelain veneers are one of the most transformative cosmetic procedures available in dentistry today. They are thin, tooth-colored shells custom-crafted to cover the front surface of your teeth effectively changing the color, shape, size, or length of your teeth. Since veneers are individually sculpted for each patient, it is nearly impossible to tell the difference between a veneer and a natural tooth. Unlike natural teeth, dental-grade porcelain is stain resistant, so your veneers will not become discolored over time assuming you practice proper home care and maintain regular visits. Central Dental primarily offers full preparation veneers as they are the most aesthetically pleasing. These veneers usually require 0.5mm to 1mm reduction of the anterior tooth surface which allows the laboratory technicians to add enhancements such as translucency, depth, texture, and masking of severely dark stains or teeth. Your dentist may recommend veneers to quickly conceal cosmetic flaws such as discoloration that resists whitening, chips, cracks, misshapenness, slight misalignment, and small gaps. By correcting chipped, cracked, and misaligned teeth veneers can strengthen the smile, improve functionality, and possibly eliminate the need for orthodontics. If you clench or grind your teeth, your dentist may require that you undergo TMJ (temporomandibular joint) treatment prior to placing veneers. It’s normal to experience some sensitivity to hot and cold temperatures after the placement of your new veneers. This typically resolves within a few days. You should be able to use porcelain veneers as you would your natural teeth assuming a healthy oral condition where destructive forces are minimized or eliminated. Although veneers are very strong, they are also brittle. You should avoid chewing ice, biting your nails, or opening packages with your teeth whether they are natural or cosmetically enhanced. Veneers are often compatible with whitening and other cosmetic, restorative, and general dental treatments and require only a few short trips to experience their cosmetic benefits. However, one week after your veneers are placed, you will be required to return to the office for a follow-up visit so your dentist can ensure your mouth is adjusting well to the treatment. Even if you feel the veneers are a success, this appointment is vital to your future oral health. Regular professional maintenance, or recare, is of great importance as porcelain veneers should be polished with a specially formulated, non-abrasive paste, and because your dentist needs to evaluate your veneers for any sign of potential failure. With proper professional maintenance and home care your veneers can last you many, many years. 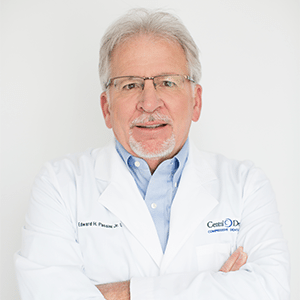 Working in the field of dentistry since 1977, Dr. Passini now focuses on general and family dentistry at Central Dental in Little Rock. He is well respected and sought after for his special interest in fixed and removable restorations. You can have a dazzling, new smile within a few short weeks! We warmly welcome patients from Little Rock, Conway, and surrounding areas to schedule a consultation with Edward H. Passini, Jr., DDS to learn more about how you may benefit from porcelain veneers. Fill out our form below or call our Little Rock office at (501) 225-1577 and our Conway office at (501) 327-6453. We look forward to seeing you.